Earlier this week, knowing we wouldn’t be eating dinner at home again for a while, I looked at the vegetables lurking in the refrigerator to see what needed using. A bunch of slightly faded Tuscan kale got eaten for breakfast (with a fried egg on top, yum), which left a bag of cute little cauliflowers, slightly spotted with brown, from our last trip to Dunbar Gardens. Cauliflower usually leads to one of two things around here: cauliflower gratin or Indian gingered cauliflower. We wanted to go the gingered route, so I went combing through our multitude of Indian cookbooks to find something to go with it.One of our slightly newer books is by Meena Pathak, of Patak’s jarred chutney and curry paste fame. Everything we’ve made out of it has been easy and tasty, except for two things: she doesn’t tell you to add salt, and she does tell you to add way way way too much cayenne (we like spicy, but after making a couple of Meena’s dishes as written we will never believe her again – yeek!) 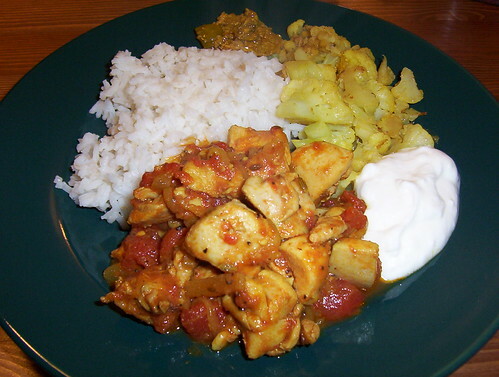 But she has a lot of nice recipes for chicken curry, which isn’t something I make very often. I picked the Black Pepper Chicken, mostly because I had everything on hand already. To make Black Pepper Chicken: Saute sliced shallots in a wide pan with a good dollop of oil. Add three cardamom pods, three whole cloves and two bay leaves – these will all pop in the hot oil and fling themselves out of the pan, so remember a spatter screen (I didn’t). Add some crushed garlic and stir it all up. Add some fennel seed (she calls for ground, but I only had whole and was lazy), ground coriander, ground turmeric and cayenne. Pour in a can of diced tomatoes and let the whole thing simmer while you get a pot of rice going. Add chicken meat cut up into about one inch pieces – I use boneless thigh meat for this sort of thing, because it doesn’t toughen with long cooking and tastes better than breast meat. I added salt at the same time as the chicken. 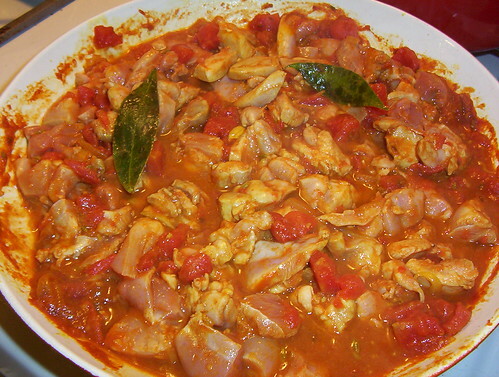 Simmer the dish for 15 or 20 minutes, stirring once in a while, until the chicken is cooked and everything else is ready. At the last minute grind in lots of black pepper. We had this with the gingered cauliflower (basically, small florets of cauliflower stirfried with ginger and garlic, seasoned with turmeric and coriander, then steamed in a little water until soft), yogurt, Patak’s chile relish and a pot of Bengal Spice tea with milk and sugar. Hey, wait a second- slightly spotted cauliflower- my image is tarnished! Glad I found your blog (courtesy of my own webstats). One question- middle name or nom de plume? Take it easy – it was spotted because I left it in the fridge for a week. Of course it was perfect when I bought it!